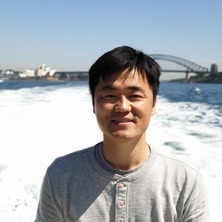 Dr. Dan Dongseong Kim is an Associate Professor (equivalent to US full professor or UK Reader) at The University of Queensland (UQ), Brisbane, Australia. Prior to UQ, he led the Cybersecurity Lab. at the University of Canterbury (UC), Christchurch, New Zealand from August 2011 to Jan 2019. He was a Senior Lecturer in Cybersecurity in the Department of Computer Science and Software Engineering at UC. He was a visiting scholar at the University of Maryland, College Park, Maryland in the US in 2007. From June 2008 to July 2011, he was a postdoc at Duke University, Durham, North Carolina in the US. His research interests are in cyber security and dependability for various systems and networks. As for my academic genealogy, my Ph.D. thesis advisor was Professor Jong Sou Park (Pennsylvania State University, 1994); his one was Paul Thomas Hulina (Pennsylvania State University, 1969); then it runs back through Jon G. Bredeson (Northwestern University, 1967), Seifollah Louis Hakimi (University of Illinois at Urbana-Champaign (UIUC), 1959), Mac Van Valkenburg (Stanford University, 1952), Oswald Garrison Villard, Jr. (Stanford University,1949), Frederick Emmons Terman (Massachusetts Institute of Technology (MIT), 1924, Sc.D.) and Vannevar Bush (MIT, 1916) to Arthur Edwin Kennelly (self-taught) (who was working in Thomas Edison's West Orange Laboratory from December 1887 to March 1894) and Duglad C. Jacson. My postdoc adivosr is Chaired Professor Kishor S. Trivedi (UIUC, 1974) at Duke University, USA. Please visit the academic tree from Duglad C. Jackson to all the way up to the ancestors at: acadmemic tree (link). Park, Jong Sou, Lee, Jang-Se and Kim, Dong Seong (2007) International workshop on Security and Survivability in Distributed Sensor Networks (SSDSN 2007). Lecture Notes in Computer Science (including subseries Lecture Notes in Artificial Intelligence and Lecture Notes in Bioinformatics), 4743 LNCS . Ohn, Syng-Yup, Nguyen, Ha-Nam, Kim, Dong Seong and Park, Jong Sou (2004) Determining optimal decision model for support vector machine by genetic algorithm. Lecture Notes in Computer Science (including subseries Lecture Notes in Artificial Intelligence and Lecture Notes in Bioinformatics), 3314 895-902. Kim, Dong Seong and Park, Jong Sou (2003) Network-based intrusion detection with support vector machines. Lecture Notes in Computer Science (including subseries Lecture Notes in Artificial Intelligence and Lecture Notes in Bioinformatics), 2662 747-756. Batten, Lynn, Kim, Dong Seong, Zhang, Xuyun and Li, Gang (2017). Preface. In: Applications and techniques in information security : 8th International Conference, ATIS 2017, Auckland, New Zealand, July 6-7, 2017, Proceedings. 8th International Conference, ATIS 2017, Auckland, New Zealand, (). July 6-7, 2017. Kordy, Barbara, Ekstedt, Mathias and Kim, Dong Seong (2016). Preface. In: Third International Workshop, GraMSec 2016, Lisbon, Portugal, (). June 27, 2016. What vulnerability do we need to patch first? Hong, Jin and Kim, Dong-Seong (2012). HARMs: Hierarchical attack representation models for network security analysis. In: Proceedings of the 10th Australian Information Security Management Conference, AISM 2012. 10th Australian Information Security Management Conference, AISM 2012, Perth, WA Australia, (74-81). 3 - 5 December 2012. Ren, Shu Qin, Kim, Dong Seong and Park, Jong Sou (2007). A secure data aggregation scheme for wireless sensor networks. In: , , (32-40). .
Kim, Dong Seong, Shin, Taek-Hyun, Lee, Byunggil and Park, Jong Sou (2007). Access control and authorization for security of RFID multi-domain using SAML and XACML. In: Computational Intelligence and Security - International Conference, CIS 2006, Revised Selected Papers. International Conference on Computational Intelligence and Security, CIS 2006, , , (887-893). November 3, 2006-November 6, 2006. Moon, Misun, Kim, Dong Seong and Park, Jong Sou (2007). Toward modeling sensor node security using task-role based access control with TinySec. In: , , (743-749). .
Kim, Dong Seong, Lee, Sang Min and Park, Jong Sou (2006). Building lightweight intrusion detection system based on random forest. In: , , (224-230). .
Kim, Dong Seong, Nguyen, Ha-Nam, Thein, Thandar and Park, Jong Sou (2005). An optimized intrusion detection system using PCA and BNN. In: 6th Asia-Pacific Symposium on Information and Telecommunication Technologies, APSITT 2005 - Proceedings. 6th Asia-Pacific Symposium on Information and Telecommunication Technologies, APSITT 2005, , , (356-359). November 9, 2005-November 10, 2005. Park, Jong Sou, Shazzad, Khaja Mohammad and Kim, Dong Seong (2005). Toward modeling lightweight intrusion detection system through correlation-based hybrid feature selection. In: Information Security and Cryptology - First SKLOIS Conference, CISC 2005, Proceedings. 1st SKLOIS Conference on Information Security and Cryptology, CISC 2005, , , (279-289). December 15, 2005-December 17, 2005. Kim, Dong Seong, Nguyen, Ha-Nam, Ohn, Syng-Yup and Park, Jong Sou (2005). Fusions of GA and SVM for anomaly detection in intrusion detection system. In: Advances in Neural Networks - ISNN 2005: Second International Symposium on Neural Networks. Proceedings. Second International Symposium on Neural Networks: Advances in Neural Networks - ISNN 2005, , , (415-420). May 30, 2005-June 1, 2005. Park, Jong Sou, Jin, Hong Tae and Kim, Dong Seong (2005). Intrusion detection system for securing geographical information system Web servers. In: , , (110-119). .